This is a series of letters that I have written to my children in a journal. Most of the letters are written to teach them in the future. I hope you enjoy reading them! Life is hard sometimes and we cannot understand why other people do what they do. Sometimes it’s a hurtful thing someone says to you, or someone not making what you’re interested in doing, a priority to them. And sadly there will be times when people are not as kind or godly as they seem to be. What you CAN do is not focus so much on finding out why they did this or that or did not do it, but pray for them. Ask God to help them, or better yet, ask God if there is something you can do to help them. Others sometimes get so absorbed in the things in their life that they don’t realize what they are doing to you. It doesn’t make it right or fair, but we have to ask God to help us rise above the hurt and be a blessing if we can. Relationships at times must change because of violations of friendship or boundaries but it does not mean we have to hate people or count them as useless. God will help you during these times. “Why do you like the name Mama?” you might ask. I like Mama much better than Mommy, because it can be used until I die. The name Mommy to me sounds like a name a baby would call their mother. My aim is to help you all grow up into mature adults, not remain a baby in your thinking or the things you do,or even the way you come to me throughout your life. You are all special to me and my hope is that you will have a name to call me that fits who you will become, not just who you are now. I hope that makes sense. Each day God is my teacher and He teaches me something. Mothers are never failures if they stop working a job to come home and focus on their family. And education does not have to be gained in a classroom setting. Where women are, they, if the desire lives in their hearts, will succeed. Working at learning balance, adjusting to the events of the day, knowing what to say at the right time to a specific person or need, finding a way to try to get housework done, and love enough to fill everyone’s basic needs is just a handful of the responsibilities. God has given me a heart for mothering you and I pray He will allow me to be a part of your lives until I can see you all succeed. 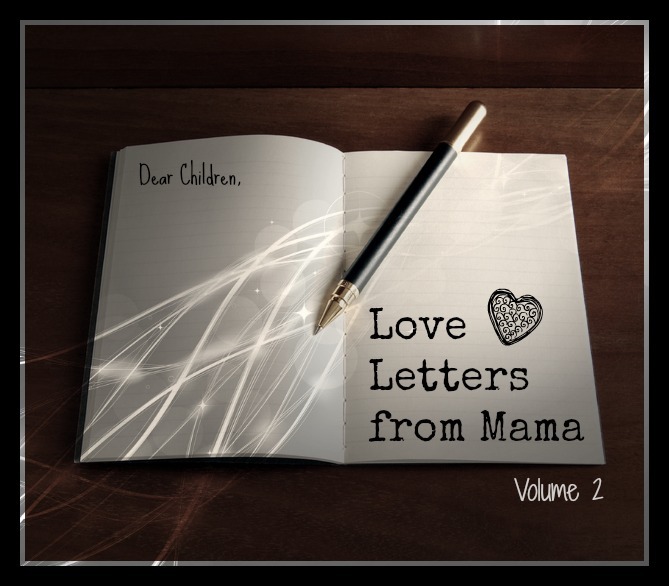 To read The Ministry Mama’s other letters to her children, click here.